These are essentially burgers made out of butternut squash quinoa ‘risotto’ – and work well on the barbeque or cooked in the oven. They are a good dish to knock up when you want to impress guests: the Middle-Eastern tang brings an interesting dimension plus much of the preparation can be done a day or two before. The resultant patties actually taste better for it. I’ve also brought these little fritters along to picnics, or just wrapped them in foil to eat out on the go; I normally hate eating cold food that’s meant to be served hot, so I don’t give out that accolade lightly. Butternut squash is great for helping everything stick together. I’ve pimped it up with harissa, cumin, coriander and pickled lemons. Pickled lemons? Yep – these are little lemons, pickled in brine, and used extensively across northern African cooking but also in the Middle-East and India. Whilst the pulp may be used in stews, the skin is the best bit: with all that salty liquid, it mellows, giving a lemony olive kind of vibe. Use sparingly though! Apparently it is easy to make your own – as it is harissa paste – but I buy both from Belazu for convenience. Any leftovers of either can go in a tagine. I prefer to peel my butternut squash for this dish: the flesh disintegrates into a mash whilst simmering with the quinoa, so random lumps of skin do not bring anything to the party! Squashes and pumpkins are tricky to peel, so to make it easy on myself, I slice it in half, boil or microwave the halves on high for 10 minutes and then pop into the oven for about 20 minutes until soft. When the skin becomes baggy and wrinkly you should be able to easily pull it away with a peeler. Prepare the butternut squash first – see my tip in the preamble about peeling. If you don’t use this method to swiftly and painlessly remove the skin, you will still need to part cook it, so once you’ve dealt with the skin, remove the seeds, chop into chunks and cook in the oven until softer – about 40 minutes (it will endure further cooking with the quinoa). Meanwhile, slice the onions and fry until translucent. Add the garlic, chilli and cumin seeds. Cook for a few more minutes before adding the slices of fennel. Let this vegetable mix to gently fry for about 5 minutes whilst you rinse the quinoa and shake off the excess water. Tip it into the saucepan, give everything a good stir, add a good pinch of salt, the apple cider vinegar and lemon/lime juice and allow the quinoa to dry out and ‘toast’ for a minute or two (keep stirring) before pouring in 400 ml water. Stir well, pop the lid on the saucepan and let everything simmer gently until the quinoa is cooked and the butternut squash has turned to mash. Regularly check that nothing starts to stick to the bottom of the pan, stir vigorously and add a little more water if it starts coming close. This quinoa ‘risotto’ will probably take a little more time to cook than just the grains by themselves – maybe about 15-20 minutes -given the addition of the squash. The grains should be soft and starting to open up a bit. Once done, stir in the harissa paste, then transfer it into a big bowl and put it in the fridge once cool. To finish off: Preheat oven to 200 (fan)/220 (conventional) or get the barbeque going. Shred the coriander leaves and stir through the quinoa-butternut squash mix. Slice each pickled lemon in half, pull out the pulpy middle and discard, then slice the skin into thin strips. Add to the risotto. Scoop up handfuls of the mixture and shape into about 18-20 patties. If it is too moist and won’t hold together, stir through a couple of tablespoons of flour. 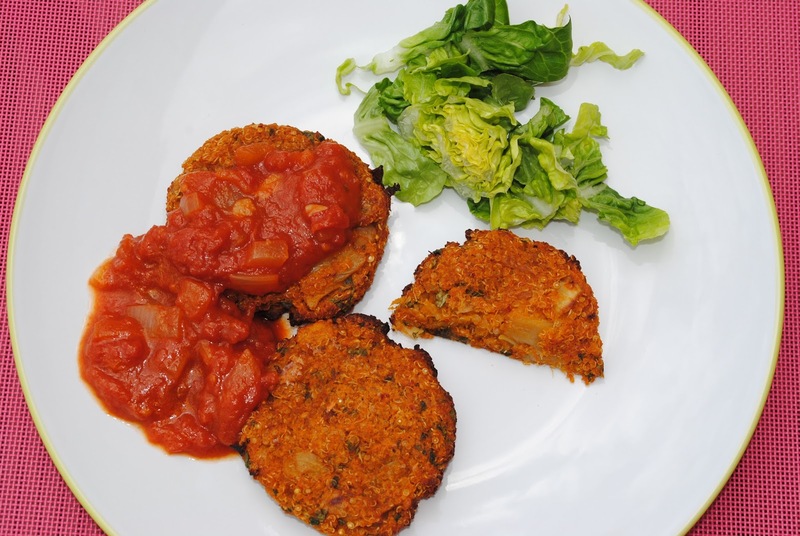 Place each patty on a floured plate and pop back into the fridge until you are ready to cook. Cook on a greased baking tin – I use a sheet of Teflon – for about 30-40 minutes (the cooking time will depend on how wet the patties are) until the burgers dry out and the shell of quinoa turns crispy. Turn once to ensure both sides cook evenly. On a barbeque, try 10 minutes on each side, initially. Serve with a spicy tomato sauce or drizzle with tahini dressing. I would love to see you share this on Healthy Vegan Fridays! It would make fantastic addition. Done! I really recommend pickled lemons too; they're pretty unique!